The events of the past few weeks which ended up requiring a litany by FOMC members over the past week is the best indication that the Fed, once again, is not listening to the markets. One might think that it´s the markets that should listen to the Fed, in particular to its ‘outlook for the economy’. But no matter the amount of information the Fed has, or the ‘technical prowess’ at its disposal, the markets process information, including the information the Fed puts out by the words of its members, much more efficiently. The Fed should have learned the lesson of 2007-08, when it did not listen to the markets, ending up crushing the economy. I´ll parse Frederick Mishkin, Fed governor from September 2006 to the ‘tipping point’ in August 2008. The stories he tells in his Macroeconomics text, published in 2011 is likely to be representative of the views prevailing in FOMC decision-making. By early 2007, one year after house prices peaked, strains begin to be felt in the financial system. In February The Federal Home Loan Mortgage Corporation (Freddie Mac) announces that it will no longer buy the most risky subprime mortgages and mortgage-related securities. On April 2, New Century Financial Corporation, a leading subprime mortgage lender, files for Chapter 11 bankruptcy protection. When the financial crisis started in August 2007, inflation was rising and economic growth was quite strong. A movement along the Monetary Policy curve would have suggested the Fed would continue to keep hiking interest rates, but instead it did the opposite: it began an aggressive lowering of the federal funds rate, despite the continuing high inflation, The Fed thus shifted the monetary policy curve down. The Fed pursued this autonomous monetary policy easing because the negative shock to the economy from the disruption to financial markets indicated that, despite current high inflation rates, the economy was likely to weaken in the near future and the inflation rate would fall. Indeed, this is exactly what came to pass, with the economy going into recession in December 2007, and the inflation rate falling sharply after July 2008. 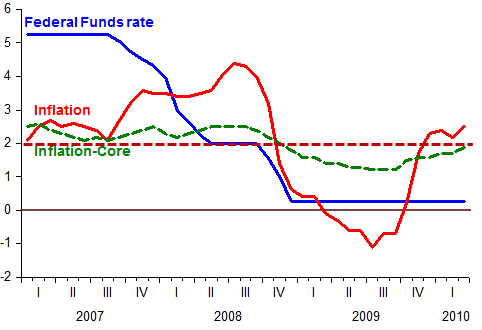 But what if, instead of looking at ‘Headline’ inflation the FOMC had focused on ‘Core’ inflation? 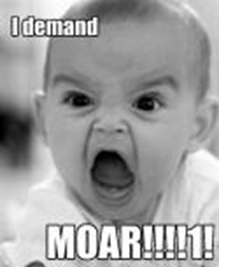 Probably they could have been much more “aggressive” in their interest rate moves! And when Mishkin says that in December 2008 the FOMC “announced a surprisingly bold policy decision” the chart below indicates that it was in fact very late in trying ‘to close the gates after the horse had bolted away’! 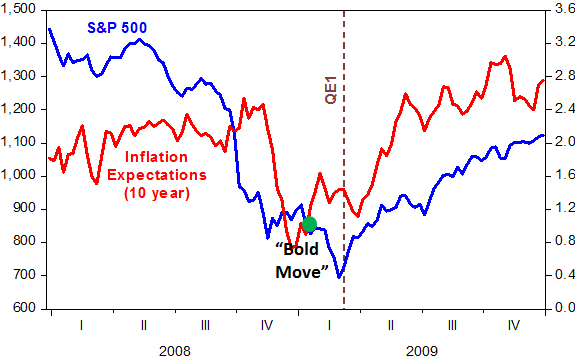 The chart shows that the stock market continued to fall and inflation expectations didn´t move much after the “bold policy decision”. That only happened when in March 2009 the Fed announced QE1. 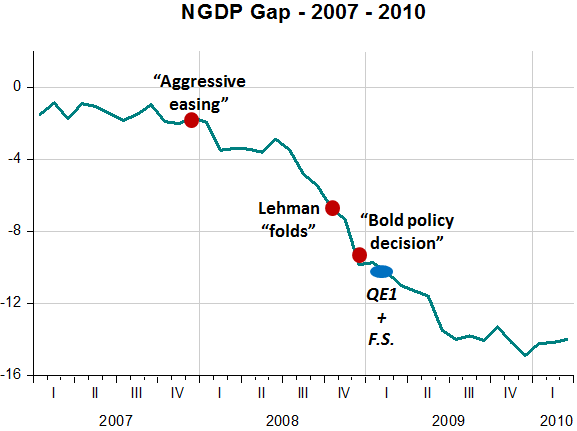 In reality, neither the late 2007 “aggressive easing” was aggressive nor was the late 2008 “bold policy decision” bold. Why do I say that? 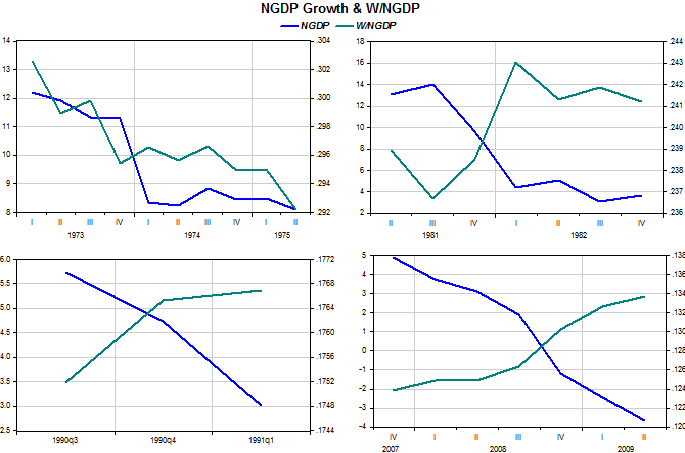 From looking at the NGDP gap (distance from the “Great Moderation” trend) chart below we observe that in late 2007 NGDP was already below trend and the “aggressive easing” did nothing to lift spending towards the trend. On the contrary, spending fell further below trend. This fact is consistent with markets being negatively surprised with the meager 25 bp “easing” that took place in the December 2007 FOMC meeting. In the fall of 2008, the US economy was in crisis. By the time the new Obama administration had taken office, the unemployment rate had risen from 4.7% just before the recession began in December 2007 to 7.6% in January 2009. To stimulate the economy, the Obama administration proposed a fiscal stimulus package that, when passed by Congress, included $288 billion in tax cuts for households and businesses and $499 biliion in increased federal spending, including transfer payments. As this analysis indicates, these tax cuts and spending increases were intended to increase planned expenditure, thereby raising the equilibrium output at any given interest rate [“zero” at the time] and so shifting the IS curve [or the aggregate demand curve] to the right. Unfortunately, things didn´t work out as the Obama administration planned. Most of the government purchases did not kick in until after 2010, while the decline in autonomous consumption and investment were much larger than anticipated. The fiscal stimulus was more than offset by weak consumption and investment with the result that the planned expenditure ended up contracting rather than rising, and the IS curve did not shift to the right, as hoped. Despite the good intentions of the fiscal stimulus package, the unemployment rate ended up rising to over 10% in 2009. Without the fiscal stimulus, however, the IS curve would likely have shifted further to the left, resulting in even more unemployment. It is from this sort of analysis that someone like Krugman confidently says that it wasn´t the case that fiscal stimulus didn´t work, it´s just that it wasn´t “big enough”. To everyone else, Mishkin´s story leaves the impression that the contraction in consumption and investment spending was “just one of those things”. It´s interesting to note that at about the same time the fiscal stimulus was announced, the Fed implemented QE1 (March 2009). Although QE1 was enough to verse the downtrend in NGDP growth, it was a far cry from what was needed to get spending back on trend. Also, with the ‘other hand’ the Fed was offsetting the fiscal stimulus. 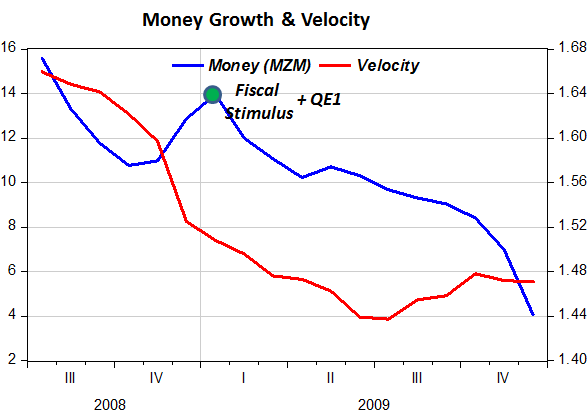 This is shown clearly in the next chart, which illustrates that from the start of the fiscal stimulus monetary growth dropped together with velocity (increase in money demand) . The analogy is with the professional driver that steps simultaneously on the accelerator and brake pedals to control the car on a curve at high speed! It wasn´t the case, according to Mishkin, that “in 2007 and 2008, the US economy encountered a perfect storm.” Much more likely it was the Fed concentrating on headline inflation and disregarding what market indicators – such things as the stock market, inflation expectations and the foreign exchange rate – were signaling. The Fed/FOMC is never wrong. It is markets that ‘misunderstand’ it! But they conveniently forget that as the “market” in market monetarism implies, market reaction IS the policy. To ‘cover-up’ their bungling FOMC members have come out in line to in fact tell the markets that they were wrong (by saying the opposite, obviously) and set the record straight. Financial markets are wrong to view the Federal Reserve as having become more hawkish in its views on the need to tighten monetary policy, Minneapolis Federal Reserve President Narayana Kocherlakota said on Monday. William C. Dudley, the president of the Federal Reserve Bank of New York, has come out with the most forceful and clear commentary on what the Fed intends to do in the months and years ahead after Chairman Ben Bernanke’s press conference last week sparked a global market sell-off. There’s only one way to interpret Dudley: Markets got it wrong. I want to emphasize the importance of data over date. If the Committee’s economic outlook is broadly realized, there will likely be a moderation in the pace of purchases later this year. If the performance of the economy is weaker, the Committee may delay before moderating purchases or even increase them. If the economy strengthens faster than the Committee anticipates, the pace of purchases may be moderated somewhat more quickly. The path of purchases is in no way predetermined; we will monitor economic data and adjust our purchases as appropriate. It is important to stress that this added clarity(!) is not a statement of unconditional optimism, nor does it represent a departure from the basic data-dependent philosophy of the asset purchase program. Rather, it involves a subtler change in how data-dependence is implemented–a greater willingness to spell out what the Committee is looking for, as opposed to a “we’ll know it when we see it” approach. When it comes to purchases of Treasury and mortgage debt, “we will continue this program until the outlook for the labor market improves substantially in a context of price stability,” San Francisco Fed President John Williams said. “Any adjustments to our purchase program will depend on the new economic data that come in,” the policymaker said. The president of the Federal Reserve Bank of St. Louis, James Bullard, says he dissented at this week’s Fed policy meeting largely because inflation is running well below the central bank’s 2% target and said the committee should have waited before authorizing Fed Chairman Ben Bernanke to detail a plan to reducing the size of the Fed’s bond purchases. The search for the best metaphor to describe the tapering of the Federal Reserve’s monthly bond purchases later this year rolled forward on Friday. The latest contestant is the Richmond Fed president, Jeffrey Lacker. “The Federal Reserve is not only leaving the punch bowl in place, we’re continuing to spike the punch, though at a decreasing rate over the next year,” Mr. Lacker said. This was reminiscent of Thursday’s best effort, which also invoked an addictive vice. And as soon as we begin to look at the labor market, a solution jumps right out at us. NGDP is highly erratic, and nominal hourly wages are very stable. 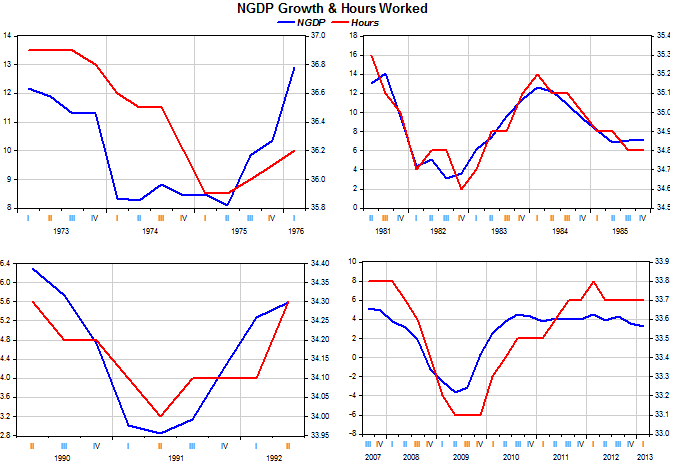 Hence hours worked moves in the same direction as NGDP, over the cycle. (Of course in the long term nominal shocks have no real effects.). One counterargument is that perhaps the nominal shocks (NGDP fluctuations) are actually real shocks, combined with a central bank policy of targeting inflation. In that case there might be no causal relationship running from NGDP to employment. Rather it might go from real shocks to real GDP to employment, with NGDP merely going along for the ride—as inflation is stabilized. But that’s why monetary history is so important. We don’t just know that NGDP and employment are highly correlated, we know that NGDP shocks caused by insane monetary policies and employment are highly correlated. That’s the smoking gun. 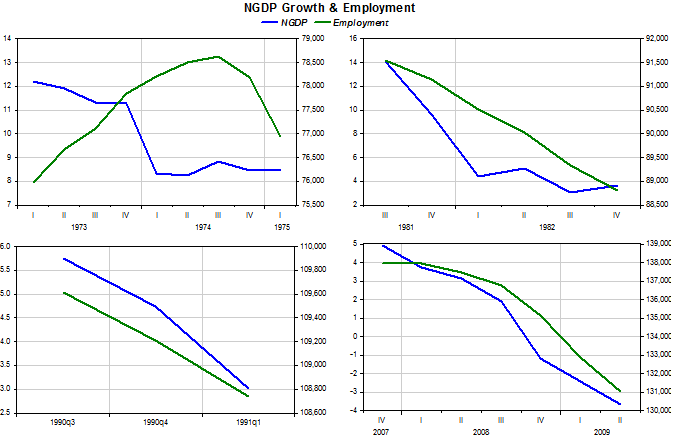 Note that in the 1973-75 cycle, impacted by commodity/oil shocks, the correlation between NGDP and employment is absent. And when NGDP is shocked by monetary policy, W/NGDP becomes very countercyclical, almost certainly because nominal wages are sticky. 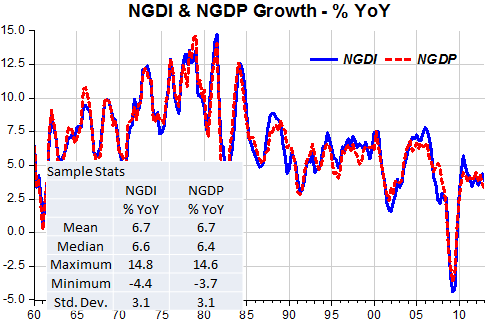 The only exception is again the 1973-75 supply shock recession in which case, as Mark Bills pointed out, W/NGDP was highly procyclical, consistent with the absence of an NGDP-employment correlation. Scott suggests the stock market “soared on the news” that NGDI annualized was a robust 5.1% annualized on average over the last two quarters, while NGDP annualized growth was only 2.2%. And ‘pleads’: “Don´t anyone tell the Fed about NGDI”. Much more likely the stock market went up (and also most everywhere else) on Tuesday and Wednesday because: (1) The PBOC said on Tuesday they would provide liquidity to the market and (2) On Wednesday Q1 real growth was revised downward significantly (supposedly diminishing the chances of an early ‘taper’). NGDI and NGDP are two sides of the same accounting coin. Data collection is not perfect, so there are discrepancies that nevertheless get offset over time to bring them back into equality. 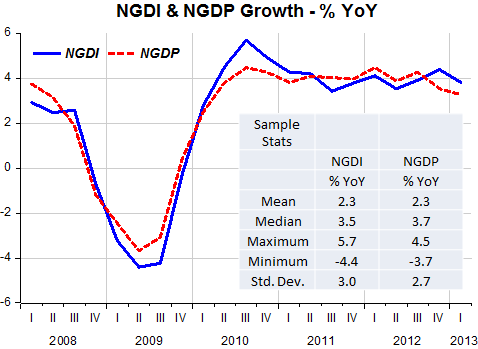 The first two charts show NGDI and NGDP growth (%YoY) for a long period and since the start of the 2007 recession. Even for the shorter period they give out the same indication for the economy´s performance. The third chart shows that for the last six months they are “coming together”, as they must. 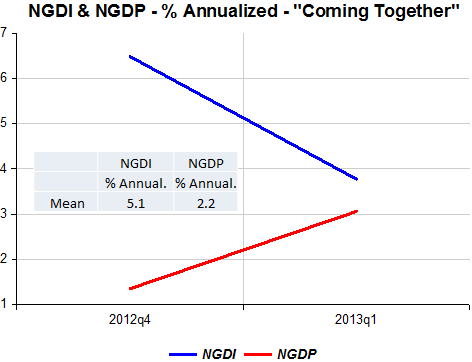 Focusing on NGDI certainly does not indicate that the economy is performing better than one might think! I reproduce below the stats table from yesterday´s post. It shows that the present ‘recovery’ is not worthy of the name, even abstaining from considering that the previous drop was the deepest in the post war period. With the release of the final numbers for the first quarter of 2013 nominal and real output growth and also of nominal income (NGDI), I put up a table of relevant statistics that show how dismal the recovery following the 2007-09 recession has been in all dimensions. We really haven´t got very far, but the Fed thinks it´s about time to take the foot off the pedal! “To kill a mockingbird”: Don´t use a 12 gauge shot gun. An objective bystander would say that if the taper is being read as tightening even though future expectations language is the same, it means that we should be throwing everything we have at the problem because everything is in play. That includes fiscal policy. As Woodford writes, “[t]he most obvious source of a boost to current aggregate demand that would not depend solely on expectational channels is ﬁscal stimulus.” We should be expanding, rather than contracting, the portfolio channel, while also avoiding the sequester and extending the payroll tax cut. Arguments, like Woodford’s, about the supremacy of any one approach tend to get knocked down by all the other concerns. The expectations channel is being blocked in several ways, most importantly because there´s not a clear identifiable target on which everyone, including the Fed, can focus. “Throwing everything we have at the problem” unfortunately will not only not help solve it but will cause a lot of additional distracting noise. In fact, that´s been the story over the past few years. Are Communists Austrian? Or is it the other way around? You can´t get more Austrian than that! 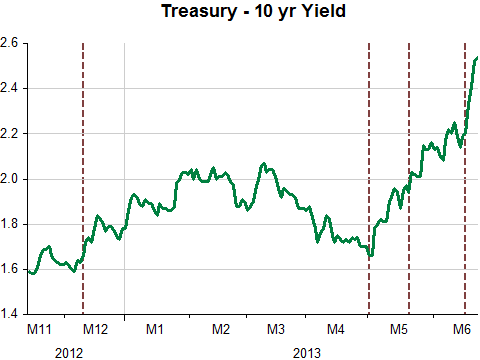 What´s the ‘meaning’ of the rise in the long bond yield after May 1st? This is being widely discussed. Evan Soltas did a post a few days ago which was picked up by Scott Sumner. I redid Evan´s chart but only show it for the more recent period and I add some ‘bells & whistles that maybe help understand the argument. The first chart shows that the stock market continued to rise following the “threshold” contingency the FOMC put out in its December 12 meeting. At that moment the correlation coefficient went up and stayed up all the way to the release of the Minutes from the May 1st FOMC Meeting on May 22nd where the ‘taper talk’ showed up. The statement from the May 1st meeting apparently gave the impression that the Fed was ‘positive’ on the outlook. Stock and bond yields went up and so did the dollar against major currencies . But on May 22nd the ‘world changed’, i.e. the view became that tightening would happen independently of economic conditions. 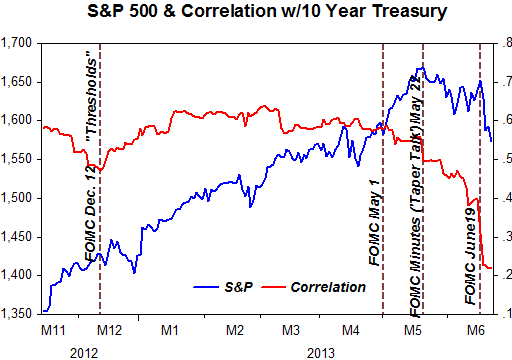 The correlation tanked. Bonds continued to rise but stocks and the dollar fell. And this was reinforced in the June 19 FOMC meeting statement and Bernanke´s press conference. 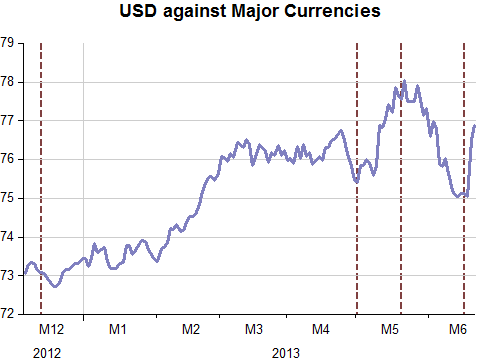 This time around, however, the dollar rose maybe a reflection of heightened uncertainty. Maybe China has lately been a factor but I think there´s no way to go around the fact that the Fed has indeed tightened. 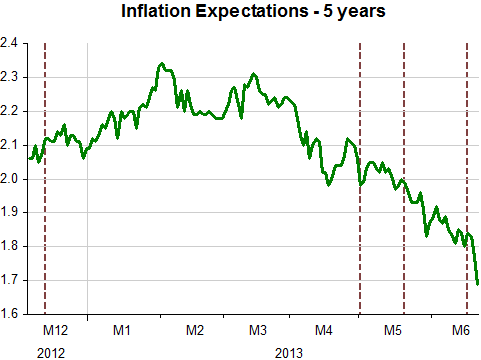 To some it´s keeping inflation low, but that´s a target, not a mission. Then they get worried and put up ‘thresholds’ but again that´s not a mission, it´s an intermediate target. Then they get all worried about ‘financial stability’, and see themselves facing an impossible trade-off, mostly because they think monetary policy is about interest rate policy, but at the moment that´s either very low or ‘zero’. Their mission is to obtain nominal stability, the framework under which myriad of individual and group decisions can most adequately be made. So it´s not at all surprising that exactly during the period when nominal stability was greatest, the economy flourished. Inflation was low and employment high. In the late 1960s and 1970s, nominal stability became unhinged in an upward direction – upward trending nominal spending. 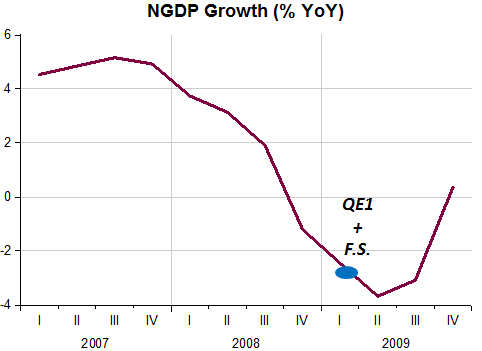 Over the last five years nominal stability became unglued in the downward direction – nominal spending way below trend. The past few days have made it overwhelmingly clear that the Fed is steering this recovery. That should be comforting; all it has to do is steer things in a more expansionary direction! But it isn’t, because the Fed keeps looking around and wondering, who’s got the wheel?